The two chicks have been out of the eggs almost exactly four weeks now, and have certainly changed hugely in that time. 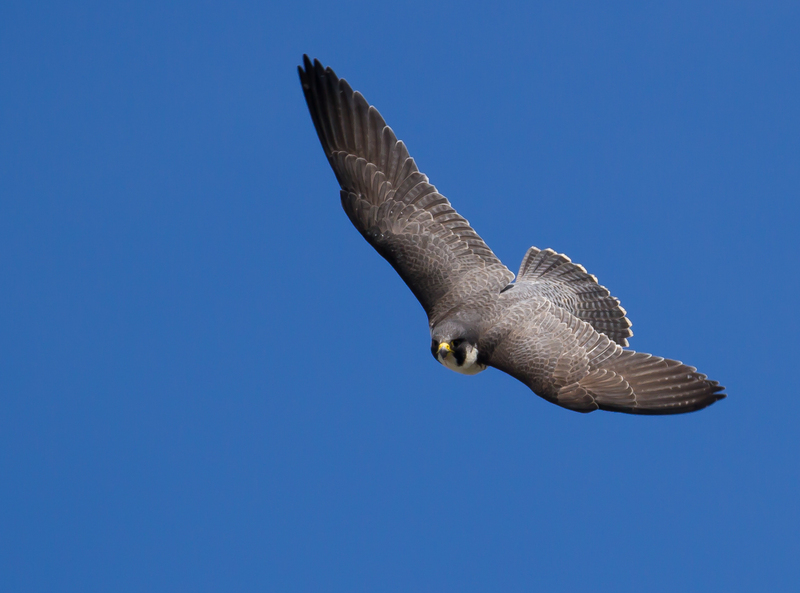 This is the time when they change from white fluffy chicks to looking like young Peregrines, and also start to move around the box with greater agility, as well as taking more of an interest in the world outside it. 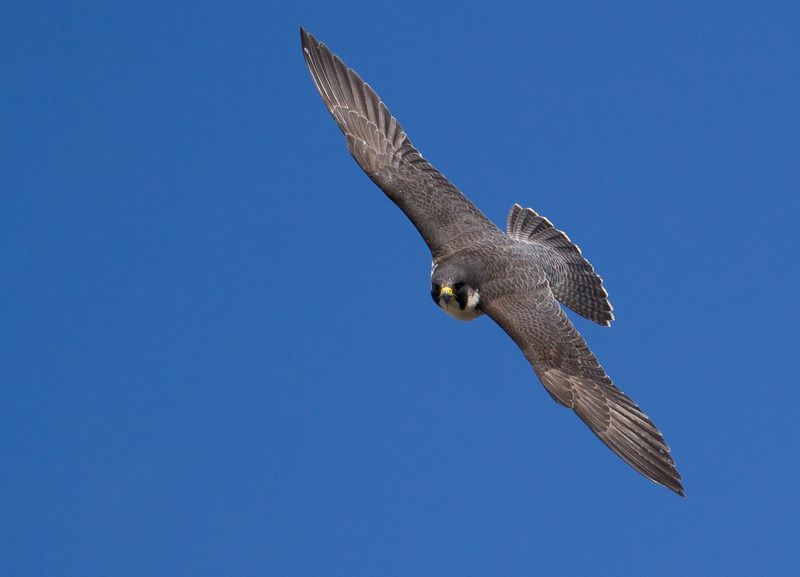 They are also starting to exercise their wings to develop the flight muscles that they will be putting into use in a fortnight’s time, and this is something we can expect to see more and more over the coming days. 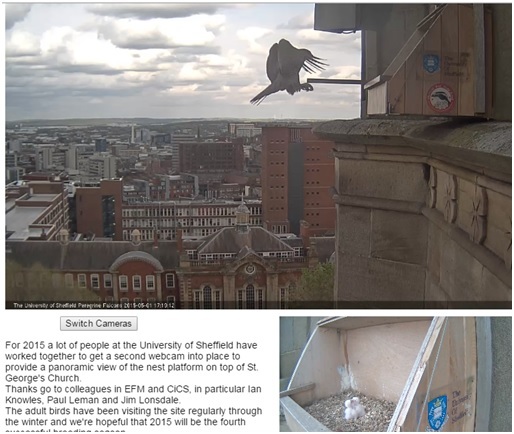 As can be seen in the screengrab below, their feathers are growing well and are especially visible in the wings and tail as they grow through the down, which will continue to be shed as they flap and preen. 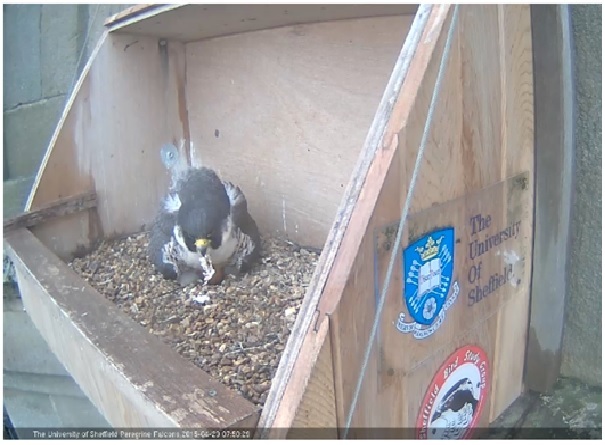 An interesting piece of behaviour over the weekend was that the male engaged in a lengthy bout of nest scraping while the chicks were in their ‘blind’ corner. Why he should do this is a bit of a mystery, but may be evidence of the strength of the drive to breed and a form of territorial behaviour. Could it have something to do with the failure of two of the eggs? The chicks that have hatched are being well looked after, even if there’s no adult on view. 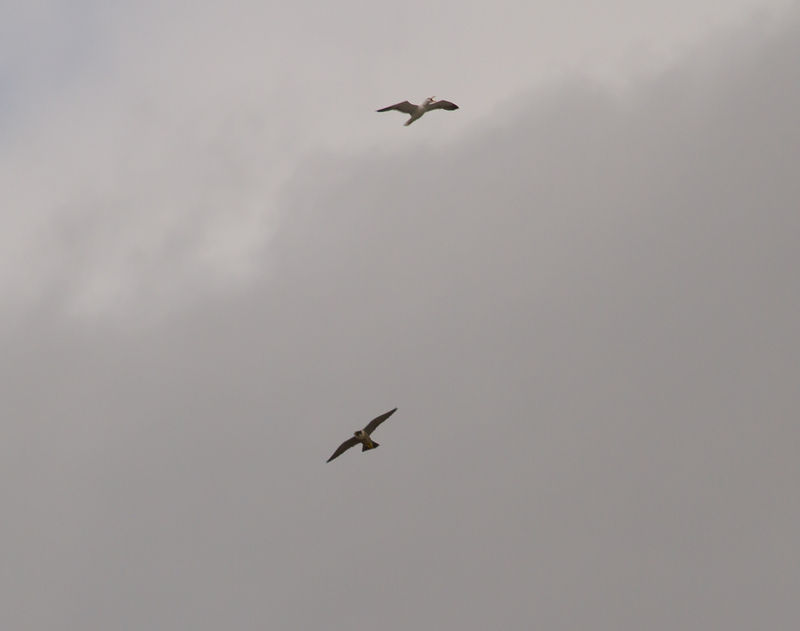 When I visited yesterday there was no sign of an adult bird, but as soon as a couple of Lesser Black-backed Gulls drifted within 100 metres or so of the church tower, the female appeared and chased them off, attacking one in a strike with talons outstretched. Apologies for the quality of the image: it all happened very quickly! She then continued to circle with them, with some occasional chasing, until they had headed off towards Attercliffe. These gulls may seem odd as a potential threat, but they are real opportunists and cruise over the rooftops looking for scraps or other morsels. 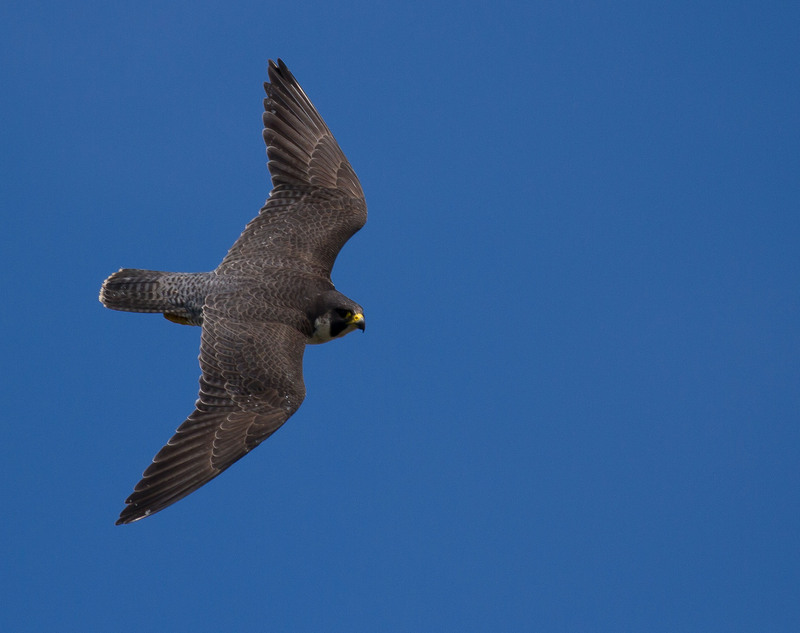 As with other large gulls, they are very capable of taking chicks of other species, though the Peregrines would appear to be far too large now to be at risk from an avian predator. 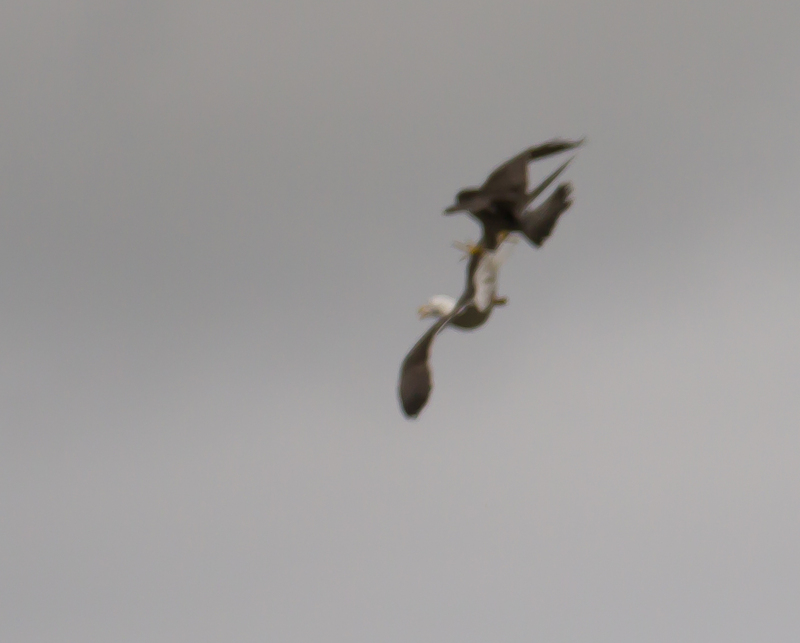 The picture above also gives a good idea of the size of the female when compared to the Lesser Black-backed Gull, and she’s the one to deal with gulls and Buzzards when they come too close. 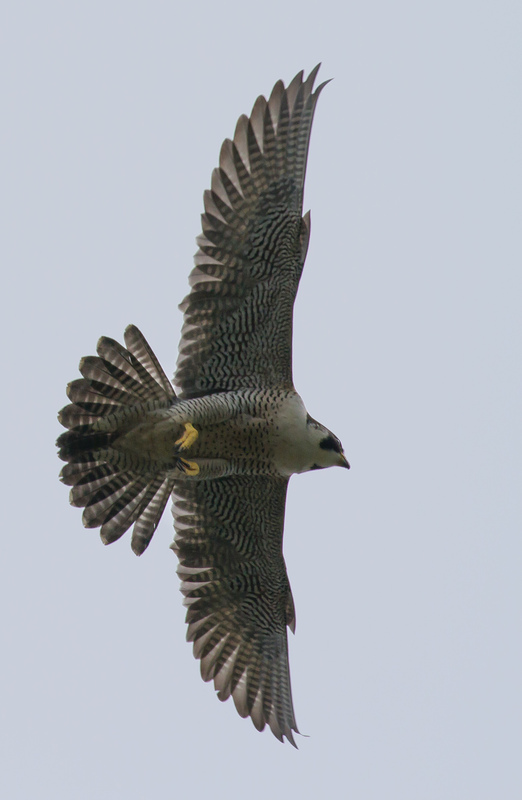 And then as she comes back to the nest site there continue to be opportunities for some excellent views. 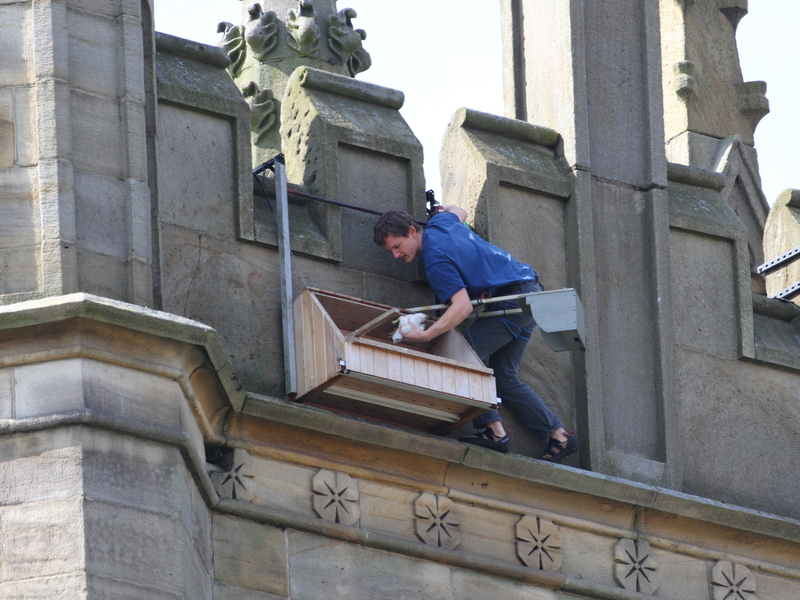 While the chicks were being ringed on Friday, Andy D was down below and took some photos that are worth sharing. 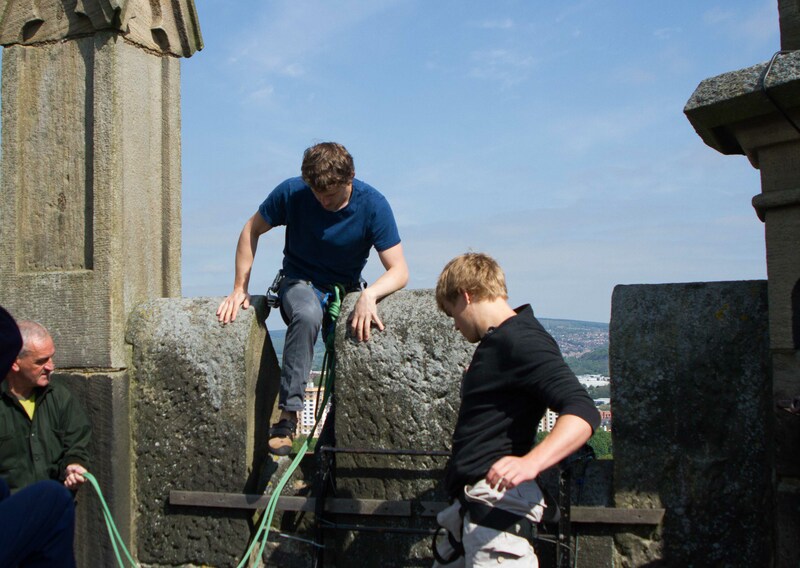 They give an idea of Simon’s sure-footedness on the ledge and his nerve! 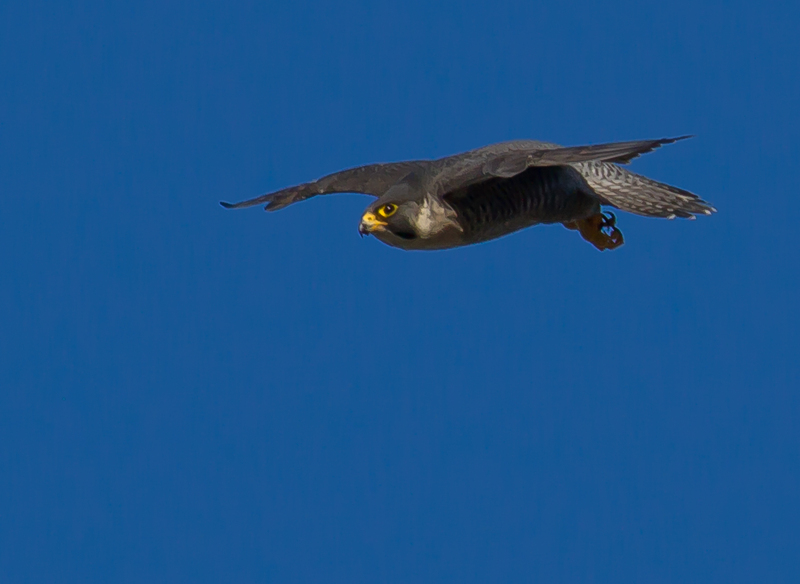 I know he had a safety rope and harness, but hanging on with one hand while lifting the chicks from the nest and passing them through to Gareth is not something I’d have fancied… The nest is about 40 metres (130 feet) above the ground and while it doesn’t look very far up from the ground, it certainly looks a long way down from the top! I think I’ll stick to words and pictures. The chicks continue to spend most of their time out of sight in the ‘blind’ corner, but over the next few days they should become more visible as they start to exercise their wings, building their flight muscles. 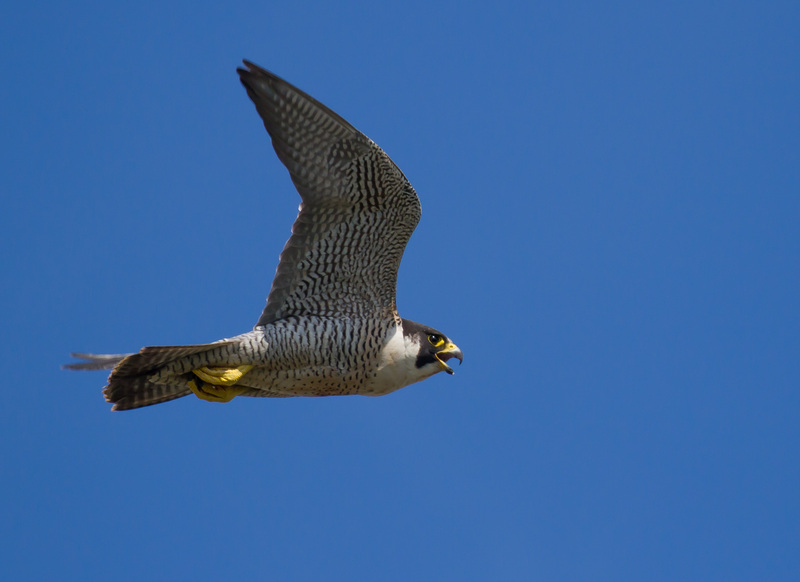 They’ll also be more able to walk around the nest box and will change quite rapidly in appearance as the flight feathers start to appear while the down begins to be lost. In the meantime, here’s an excellent sectional image from the twitter feed that shows how much space the chicks have got to hide in, just in case you’ve not seen it there. 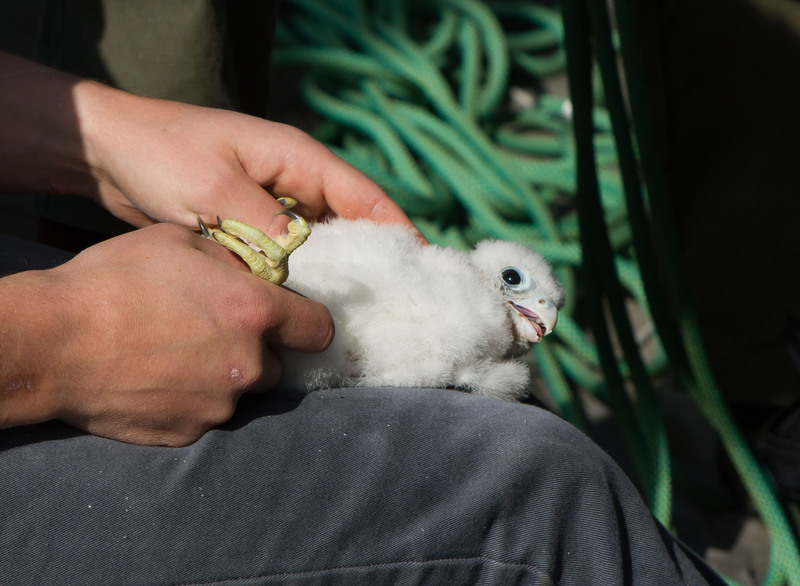 With the chicks growing rapidly, the window for ringing them was equally rapidly closing – they can’t be ringed when too small and if they’re more than about 20 days old, when they’ve become mobile, there’s a risk that they’ll jump out of the nest box. Members of Sorby Breck Ringing Group (whose Chair gave an excellent talk to Sheffield Bird Study Group last week) arranged to ring the chicks in liaison with Jim and John from the University Estates Dept. and all was set for yesterday morning, which explains the lack of webcam stream for an hour (thanks for seeing to that Ian!). 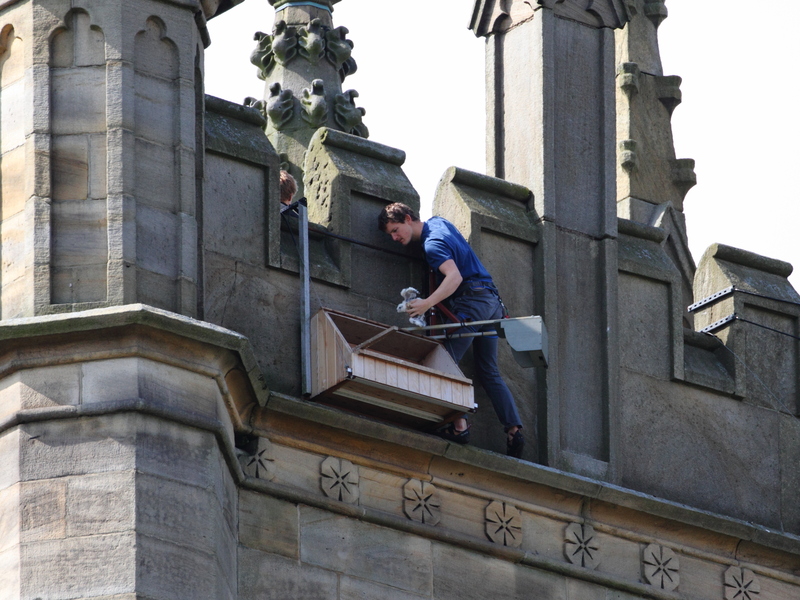 With a special licence from the British Trust for Ornithology, the Sorby members were able to access the nest with climbing gear, so up the tower it was to go over the top and ring the chicks. 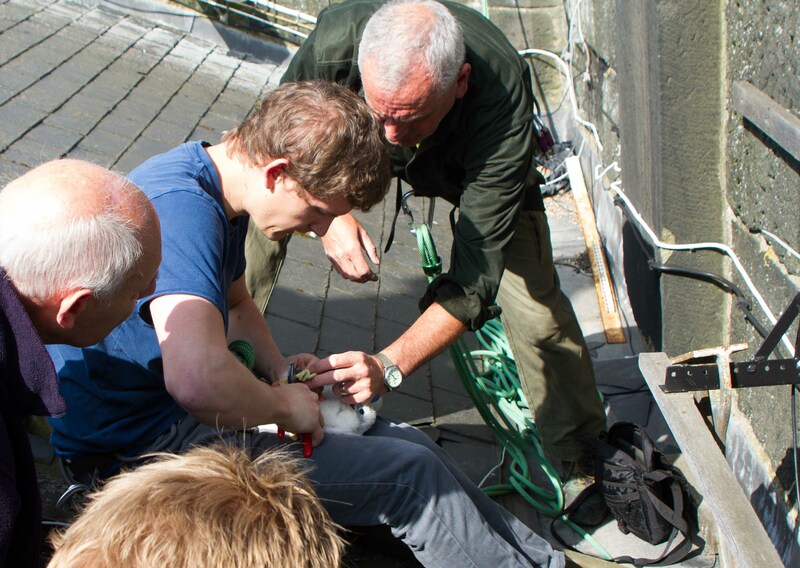 Simon went out over the ledge and passed the chicks one by one to Gareth and they were then ringed under Steve’s supervision. Everything went very smoothly and the chicks were returned to the nest within 10 minutes or so. As a result, they are now both sporting a BTO ring that will allow them to be identified. A small amount of down was also taken to enable DNA identification should this prove necessary at any point. For now, they appear to be two females, both in good health. 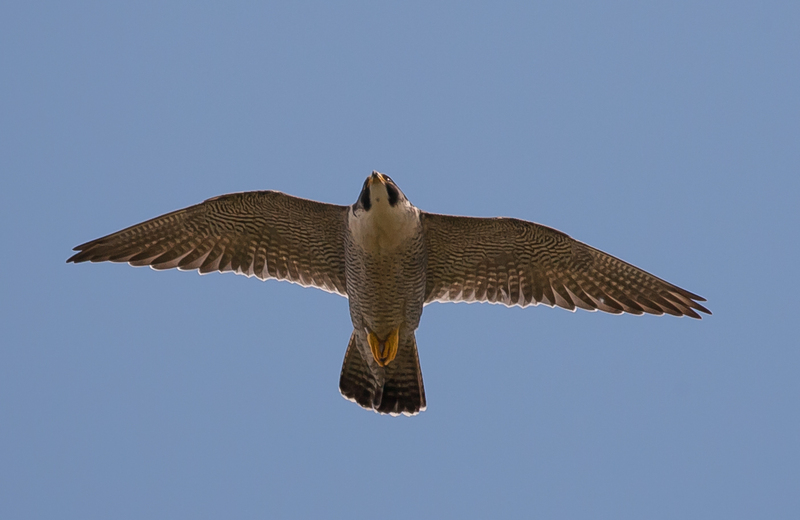 While the chicks were being ringed the parents were very agitated and both circled the tower, the male at some height but the female keeping much closer and making passes over us. It was an unprecedented chance to get some photos from a higher level, including some from above as she banked around to circle. 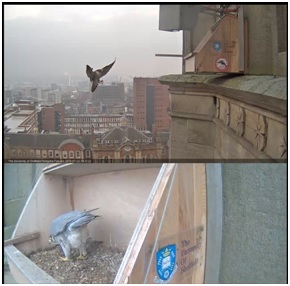 By the time we were back down on the ground, the female had already landed back on the ledge by the next box and everything very quickly settled back down. A visit this afternoon confirmed that all was back to normal, with both adults perched on the tower, though out of site from the webcams as they favoured the E side, perhaps to keep out of the stiff wind. 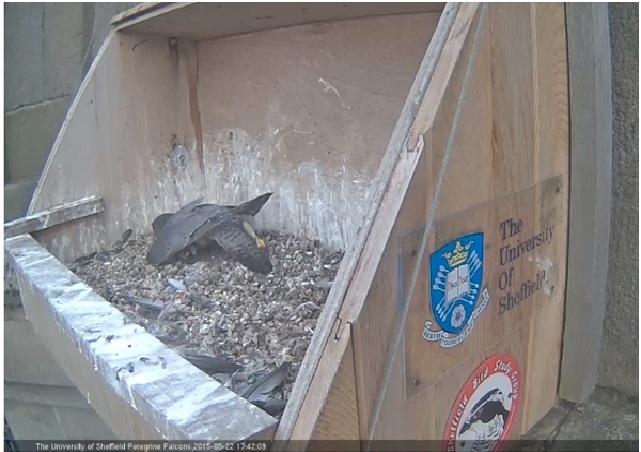 In the wind of recent days, the chicks too have been keeping scarce, tucked in the ‘blind’ corner of the nest box and not even visible when the parents bring in a feed, as the female did this afternoon, catching a Feral Pigeon after a stoop behind the buildings opposite the nest. There has been some concern via the blog that the female’s foot is damaged, but it seemed to be in full working order in this episode, though she has been holding it ‘limp’ on the nest at times. 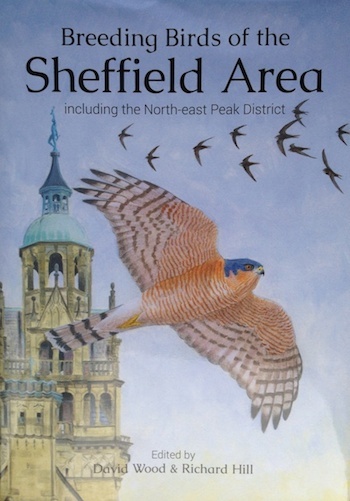 At one point, with both adults on the tower, the female called briefly and then set off, soon followed by the male and they both headed off over the rooftops. 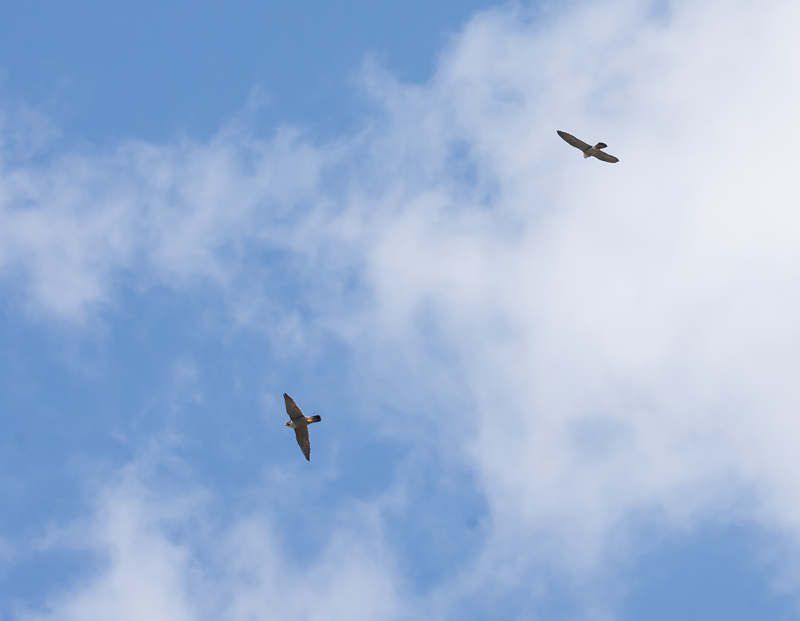 I eventually realised that they had spotted a Buzzard and were on their way to see it off, proof of their fantastic eyesight and their ongoing protection of the chicks from any threats. So the chicks are healthy, ringed and almost three weeks old – everything seems to be going well. The other two eggs were removed from the nest for analysis to see if we can find out why they didn’t hatch and learn anything more about the pair. 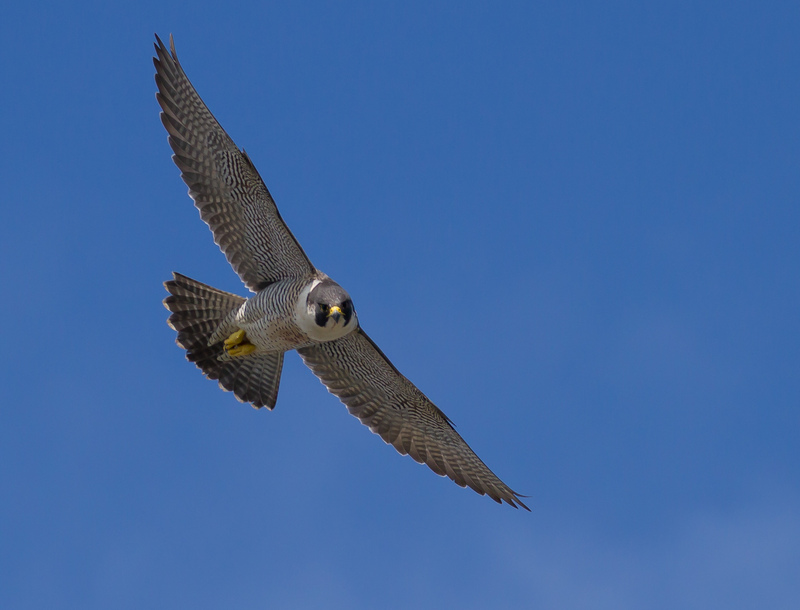 With just the two chicks to feed this year, it may well be that they grow more quickly and could be ready to fledge a little earlier than the June 5th date that has seen the first flights in both of the last two years. 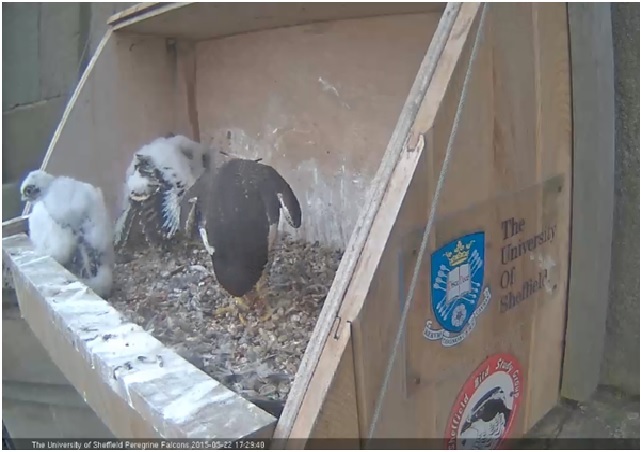 Over the next week the chicks will start to change their appearance quite markedly, as the first proper feathers were in evidence in their wings when ringing them. 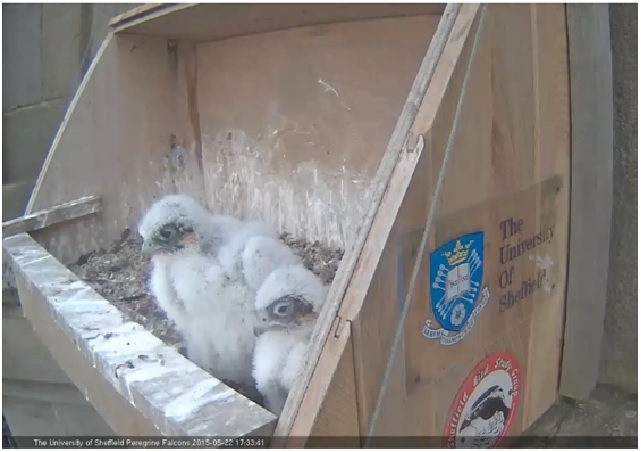 All being well, one day they’ll fledge and become expert fliers. There are a lot of people to thank for making the ringing possible, especially Steve, David, Gareth and Simon from Sorby Breck Ringing Group, as well as Jim, John, Ian and Pete from the University. This whole project continues to be very much a joint effort and we’re fortunate to be able to count on so many talented people ready to share their skills and experience. 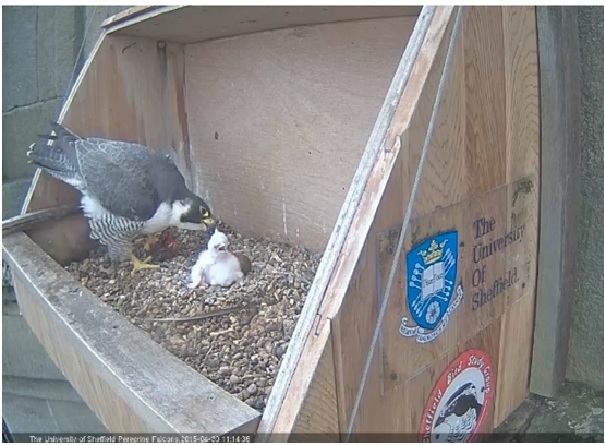 Just about a week on from the first chick having hatched and we seem to have come to a halt with just the two chicks this year, the second having hatched by 07:00 on Tuesday 29th, according to brief glimpses seen under the female. Something that was very evident was the shell from the egg from which the chick had just hatched, and the female soon proceeded to eat the shell, a well-known piece of behaviour that will presumably replace calcium, much of which will have been given over to the eggs during laying. With two chicks hatched in quick succession, all looked set for a repeat of last year’s scenario and the hatching of all four eggs. However, as the hours and days rolled by no further ‘chips’ in the eggs could be seen (despite a couple of moments of hope) and as things stand it may well be that we have two chicks this year, as we did in 2012. 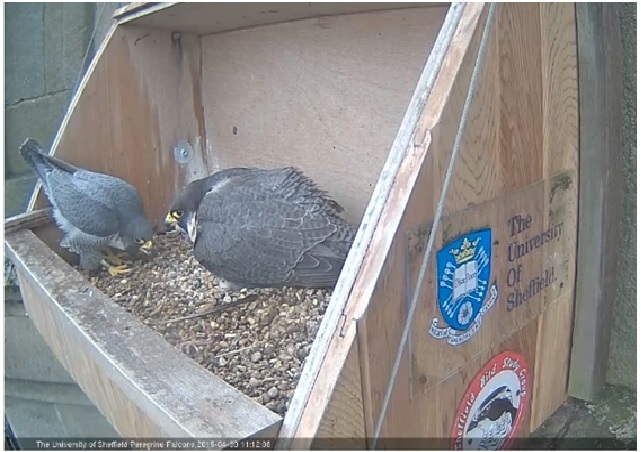 The male has been keen to take over from the female on incubation/ brooding duties, though the female has at times been reluctant to hand over – as in the screengrab above, where the size difference is very obvious. This has been the case both for brooding and at times when he’s come in with prey to offer a feed. Something I’d not noticed before was that when food was being offered to the chicks in the first few days, each time the female was ready with a tiny morsel in her bill she called quietly to get the chicks’ attention. This will be because the chicks are born with their eyes closed and have very poor vision for the first days they are open, which means for much of the first week. 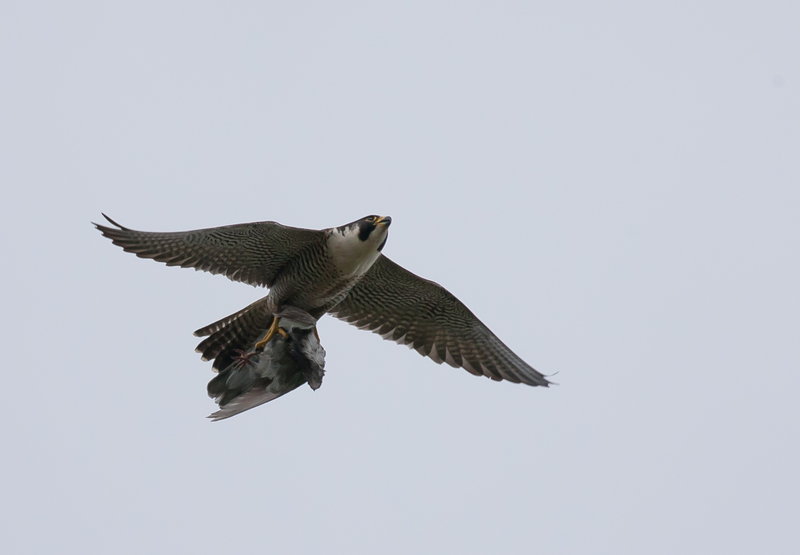 Things have settled into a routine of brooding and regular feeds, with regular comings and goings and the chicks left unattended only briefly as they remain vulnerable to predation by Crows or possibly Lesser Black-backed Gulls, with both species over and around St George’s from time to time. Why have only two eggs hatched this year after three in 2013 and all four in 2014? There are several possible reasons: the eggs may not have been fertile when laid; the first (and second) eggs laid may have become chilled when left unbrooded in unseasonally chilly weather; or perhaps the female is losing breeding condition as she becomes older – the number of eggs laid and chicks hatched both tend to decline over the years. It’s still possible that another egg will hatch, though increasingly unlikely as they would normally be expected to hatch over a period of some 48 hours. Last year we had the first chick hatch on April 28th (as this year), and by April 30th we had all four hatched. The female is still incubating the eggs and pulling them underneath her, but as the chicks grow they require more of a gap between her and the gravel, which in turn will presumably reduce the heat received by the eggs. A visit to St George’s this morning provided plenty of good views as both adults came and went, taking turns on the nest. 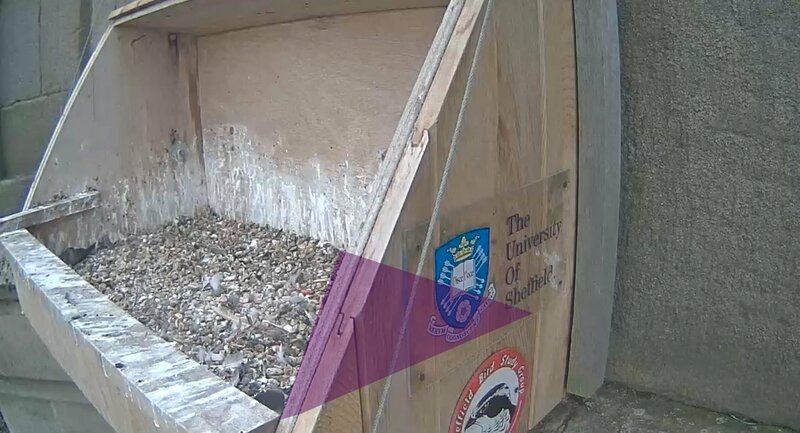 The male is often perched up out of sight of the webcams when he’s not on the nest, so all seems to be going well, even if we only have the two chicks to enjoy.